Palm oil plays a decisive role in the lives of almost everyone of us. Being a low-cost resource, palm oil is in great demand and is contained in virtually everything. You can find it in foods ranging from frozen pizza to chocolate bars, in laundry detergents and cleaning agents, in cosmetics, in diesel fuel tanks and in combined heat and power plants. Here are some facts about palm oil you may have been unaware of. Why is palm oil an issue? Worldwide demand for palm oil has increased sharply over the last few years. 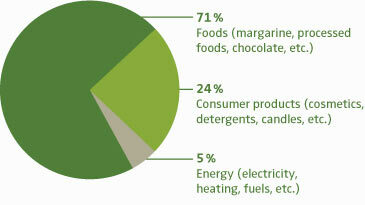 With 54 million tons in 2011, it is the most widely produced vegetable oil worldwide. It has the highest yield of any oil crop and is the cheapest vegetable oil to produce and refine. Its properties make it highly versatile in the food and chemical industries. It has a high melting point, making it smooth and easy to spread. Palm oil is contained in thousands of supermarket products. More than 90 percent of the palm oil produced is used to manufacture food products, cosmetics, detergents and candles. How does palm oil destroy the rainforests? Since oil palms need a rainforest climate – consistently high humidity and temperatures – and a lot of land, plantations are often established at the expense of rainforests. About 90 percent (2011) of the world’s palm oil is currently being produced in Malaysia and Indonesia. Indonesia’s oil palm plantations alone already cover nine million hectares, an area the size of the state of Maine. 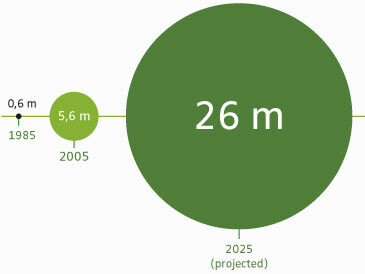 26 million hectares are projected for 2025. According to the report "The Last Stand of the Orangutan- State of Emergency: Illegal Logging, Fire and Palm Oil in Indonesia's National Parks" (published in 2007 by the United Nations Environment Program UNEP), palm oil plantations are currently the leading cause of rainforest destruction in Malaysia and Indonesia: "A scenario released by UNEP in 2002 suggested that most natural rainforest in Indonesia would be degraded by 2032. Given the rate of deforestation in the past five years, and recent widespread investment in oil palm plantations and biodiesel refineries, this may have been optimistic. New estimates suggest that 98% of the forest may be destroyed by 2022, the lowland forest much sooner." CO2 emissions – In preparing rainforest land for a palm oil plantation, the most valuable trees are cut down and removed first. What remains is cleared by burning. If the forest was on peatland – as is the case in much of Indonesia – the land is drained. Peatlands store vast quantities of carbon, and the conversion of a single hectare of Indonesian peatland rainforest releases up to 6,000 tons of CO2. Tropical deforestation is currently responsible for about 18 percent of greenhouse gas emissions, making it a significant contributor to climate change (see 4. Intergovernmental Panel on Climate Change, IPCC). Loss of biodiversity – Indonesia's rainforests and peatlands are among the world's most species-rich environments and home to numerous endangered plants and animals, such as orangutans, Sumatran tigers and Bornean rhinos. The destruction of natural habitats deprives the animals of the basis for their existence, causing an irreversible loss of biological diversity. Orangutans are particularly vulnerable because they are dependent on large contiguous forest areas. In search of food, they often get lost in the plantations, where they are regarded as pests. According to the Centre for Orangutan Protection (COP), at least 1,500 orangutans were clubbed to death by palm oil plantation workers in 2006 alone. According to the UN, there is a risk that no wild orangutans will remain outside of protected areas by 2020. Why is palm oil not listed as an ingredient on most products? Only a few manufacturers – mostly in the organic sector – label their products as containing palm oil and palm fat. Most companies disguise it, referring to it as “vegetable oils and fats”. According to its own figures, the Unilever Group alone consumes 1.6 million tons of palm oil every year (2008). Is organic palm oil environmentally and socially responsible? The organic food industry also relies heavily on palm oil. Hundreds of products of major manufacturers such as Alnatura, Allos and Rapunzel contain the tropical oil. While organic farming prohibits the use of pesticides, chemical fertilizers and genetic engineering, organic labels do not establish standards against rainforest destruction and land grabbing. Furthermore, vast industrial monocultures – including those that fulfill organic production standards – can hardly be deemed environmentally sound. The largest manufacturers and exporters of organic palm oil are based in South America. In Colombia, the Daabon Group manages 4,000 hectares of organic oil palm plantations southwest of Santa Marta on the Caribbean coast. Daabon also operates a biodiesel refinery with an annual capacity of 110,000 tons. Agro Palma – the largest palm oil producer in Brazil – states that it operates 39,000 hectares of oil palm plantations on former rainforest land in the state of Pará in the Amazon. Its certified organic palm oil is produced on the 4,107-hectare Hacienda CPA. The geometric patterns of plantations located in the rainforest are easy to spot on Google Earth satellite images of the Tailândia and Acará districts where the Agropalma plantations are located. What about sustainable palm oil (RSPO)? Major palm oil producers and consumers established the Roundtable on Sustainable Palm Oil (RSPO) in cooperation with the WWF. Members include Wilmar International, Cargill, Nestle and Unilever, and the label association is chaired by a senior executive of the Unilever Group (Dove, Knorr, Rama, etc. ), one of the world's biggest purchasers of palm oil that consumes an annual 1.4 million tons. The aim of the industry label is to promote the production and sale of palm oil even further and restore its social acceptability. The RSPO does not rule out the clearing of rainforest. Only primary and “high conservation value” (HCV) forests have been considered off-limits for palm oil plantations under the label since November 2005. An internationally recognized definition of HCV areas has not been established, however, and the transitions between primary and secondary rainforests are blurred in practice. Most of the social aspects that have been defined by the RSPO are general principles and human rights, the compliance with which should be self-evident. Nevertheless, farmers and indigenous people are displaced from their lands, threatened and arrested if they resist the land grabs. Compliance with the criteria is not reviewed adequately, and violations are rarely punished. Wilmar, the world’s leading palm oil company, is involved in 100 land conflicts and human rights violations in Indonesia alone. Sinar Mas, another major RSPO player, has cleared tropical rainforest all over the country for its palm oil plantations, and is still expanding rapidly. Climate protection is a consideration that the RSPO ignores completely. Greenpeace International considers RSPO to be “little more than greenwash”. In our view, the label essentially deceives the public. Uniform oil palm monocultures have a very low level of biodiversity and are no comparison to the richness of a rainforest. Clearing tropical forests and converting them into plantations destroys the habitat of an enormous variety of animal and plant species. How does palm oil affect local people? The remains of a village – all for the benefit of Unilever’s palm oil. Plantations are often put in place without consulting the people who live in the forest or depend on the land for their livelihoods. In Indonesia alone, where 45 million people live in forests, the palm oil industry is responsible for around 5,000 land and human rights conflicts. If the affected people resist, they are often forcibly displaced, like the inhabitants of the village of Sungai Beruang in Indonesia. 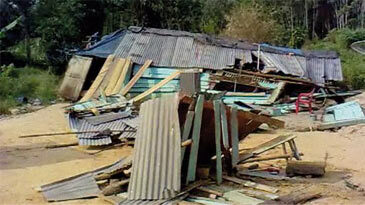 Even the people in the adjacent settlements of the plantations frequently lose their livelihoods. Not only do they rely on the forest as a natural water reservoir and source of food, but also as protection against landslides and floods. The chemicals used on palm oil plantations pollute the soil and water, thus making other forms of agriculture impossible. Almost half of palm oil consists of saturated fats, which are known to cause high cholesterol and heart disease, and are generally regarded as a cause of obesity. Palm kernel oil, which is often used for cocoa icings, ice cream and caramel, contains up to 80 percent saturated fat. Palm oil contains fatty acid esters (3-MCPD and glycidol fatty acid esters) that are considered carcinogenic. Concentrations of such hazardous substances are especially high in refined palm oil, an ingredient in infant formula. Popular chocolate hazelnut and chocolate spreads also tend to contain a lot of palm oil. Children are especially vulnerable in this regard because of their low body weight in relation to the quantity of harmful substances they consume. The German Federal Institute for Risk Assessment (BfR) has issued a warning against consuming the substances contained in palm oil. Is palm oil used in fuels as well? Many countries require the blending of “biofuels” by law. In 2010, the mandatory share in the EU was 6.25 percent. While it is currently only possible to add small quantities of palm oil to fossil diesel, that is set to change in the near future. The properties of palm oil can be modified by hydrogenation, a chemical treatment. Neste, a state-owned Finnish company, has patented a hydrogenation process and intends to flood the European market with cheap palm-oil diesel. In preparation, Neste Oil has built three huge palm oil refineries in Singapore, Rotterdam and Helsinki. Eight certification schemes have been approved in the EU to ensure that only “sustainably” produced biofuels are used. Furthermore, biofuels must attain a CO2 reduction of at least 30 percent over fossil fuels. Yet both the certification schemes and the CO2 calculations are seriously flawed and incomplete. Many analyses and environmental impact reports on palm oil and biodiesel neglect emissions related to the management of plantations, such as those released in the production and distribution of the large amounts of fertilizer needed. Transporting the oil and the refining process also cause emissions. The United Nations and researchers from around the world are calling for an immediate stop to biofuels. Tell others about the problem. Call on your political representatives to advocate the mandatory labeling of palm oil. Demand transparency about the sources of palm oil in all consumer products. The spread of palm oil plantations at the expense of natural forest must be stopped. You can make a difference as a consumer by making your voice heard.